Ten local artists interpret their homeland in Utah Ties. CUAC—the art gallery that began life as the Central Utah Art Center in Ephraim, Utah, and from humble beginnings sprang to center stage in Salt Lake City's 200 South art district—celebrates 10 years of the annual juried exhibition Utah Ties this month. Several developments distinguish this show from previous years', not the least of which is CUAC's director, Adam Bateman, selecting as its curator someone with a West Coast aesthetic and orientation. Curator Rob Greene, originally from rural West Virginia and Virginia, has his own "Utah ties," having attended Brigham Young University for a degree in economics. Working in the finance departments of MGM Studios and 20th Century Fox until three years ago, he now owns Greene Exhibitions in Los Angeles, whose shows have received note in major art publications like Artforum, Flash Art and Contemporary Art Review Los Angeles. Selecting only 10 artists in an annual exhibit that usually features 20 or 30 might appear to exclude a wide swath of local artists, genres and styles. But this particular group allows artists' methods to be viewed more in-depth, and for artists to engage in dialogue with one another. The exhibition consequently emphasizes the social nature of art and the strength of thematic and stylistic "ties" connecting this group of Utah artists. The variety of media included is far from comprehensive but still seems to represent a certain cross-section of work by local artists, providing a snapshot of the contemporary Utah arts environment. Digital art is present in the form of inkjet prints by Kendal Bryan, Daniel Everett, Noah Jackson and Jacob Haupt, and video works are presented from Rachel Barney and Daniele Vickers. Emily Ellis' sculptural works are slightly architectural. Deaf until the age of 3, she says, "The early absence of this sense gave me a hyperawareness of the importance of tangible objects in enhancing one's reality." Painting is only represented by Roland Thompson, and his "Brake Light Sunset" (oil on aluminum)—with its geometric contours and vibrant colors—brilliantly references West Coast abstractionism. Kelly Brooks' works in marker on cotton paper chart the patterns of everyday life in her household, transcribed from watching themselves on video, making a nod to the effects of surveillance in modern culture. Bateman notes that, true to the title, Utah Ties has often featured people from all around the country who "call themselves Utahn," for various reasons—either because they are originally from here, or because they spent a significant period here that had a profound impact on them. This year, however, all of the selected artists currently reside in Utah. Bateman explains the exhibit's mission: "By offering one exhibition that features Utah artists, no matter where they live, CUAC attempts to build a community around the broad cultural impact Utahns are having within Utah and nationwide." This year's artists were able to have that same impact while remaining here. Greene chose works that had a West Coast influence, which might be described, at the risk of overgeneralizing, as a feeling of being light and airy, while still sometimes taking on dark subject matter. He says, "I selected pieces that I felt would draw interest and acclaim in any setting in the world. ... What ended up driving the selection were very obvious practices and pieces that seemed to be in close dialogue. As these pairings emerged, the rest of the conversation that needed to happen fell into place." Among the most compelling of these artistic "conversations" are Etsuko Kato's gelatin silver prints "Jean" and "Tom," and Bryan's "Untitled 2." Kato's prints—in the Japanese tradition of taking portraits of elders as a testament to their lives after they have passed—is an artistic examination of the presence of those past. 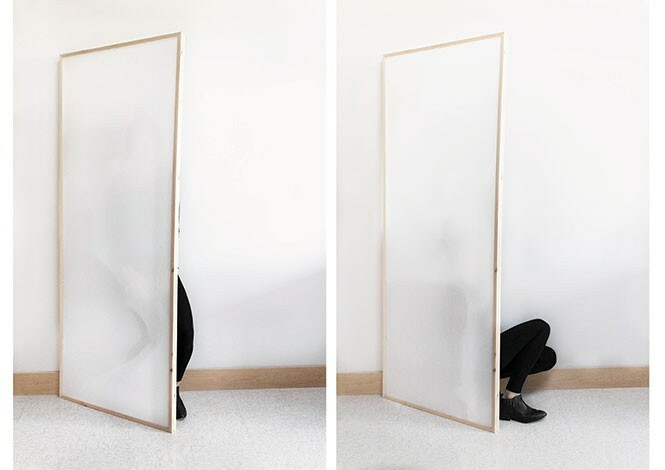 Bryan's image, meanwhile—of two people hiding behind screens—depicts existence as absense, hiddenness, a desire for anonymity, and it suggests a contemplation of what that implies about identity. The two video pieces in the show also create a dialogue about the nature of ritual. The subtext that really "ties" Utah art to the art of California is a sense of loneliness, even amid community, with a profoundly strong individuality. Haupt's "Necromancer" and "Miniboss" look at loneliness through the context of video games, depicting outlandish characters. "I have experienced an intense loneliness after the ecstacy of gameplay wears off," the artist says. "In this moment, the seams and artificiality in the imaginary world become more visible, even though they were there all along." These artists use artifice to investigate loneliness, but also in a quest to ultimately transcend it. Greene has found, he says, that "the culture of Utah is based on a faith system that unabashedly mandates each person to seek out their destiny of transcendence. I think that is why you see so much work that is about the connection to ancestors, who are treated with greater reverence in Utah than many other places, or as the self here as a temporary, short-lived character on a much longer, eternal journey."